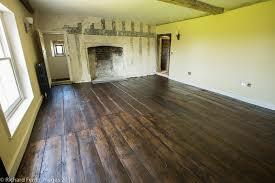 Floor sanding and polishing Suffolk with listed buildings. I sometimes get asked if i can do very very old floors like in listed buildings for floor sanding and polishing Suffolk, where the floors are really uneven? Well yes I can, I have completed several of these projects in the past and two just recently, one in a very old cottage set deep in Thetford forest Norfolk and another at Lawshall near Bury st Edmunds Suffolk, a grade 2 listed building. I wasn’t allowed to do much to the floor, so rather than sand the wooden flooring back to bare wood, Ijust lightly sanded the floor and removed some of the Victorian black bitumen type paint that the Victorians liked to use back then. Two coats of Osmo tints hard wax oil was applied to finish the floor, as you can see from the photo the came up really nice and in keeping with this property.